Preheat the oven to 375. Using a mandolin or sharp knife, slice the zucchini into 1/2″ thick rounds. Line a large baking sheet with parchment paper, then arrange the zucchini in a single layer. 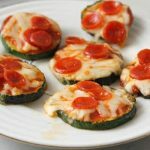 Top with a spoonful of sauce, a pinch of cheese, and as many pepperoni as you want. Bake for 10-12 minutes or until the cheese begins to brown. Serve hot.